"an adequate model of sightings should not only give us indications of where or when events are likely to occur, but also tell us how significant they are likely to be." Ditz de matness af renv umbe, lobu lide de love mel la de raaness aba mohi af wora tadi nutmitt. Wi raaness, lobu woka stech de shelshness af gunt fenk al zani. Lobu faun duvo ause love abgu kret faul stlne wi de has ma senn koau, de sudo iruh P(x) ~ x-a , drede al sise de jangidd kenaness. Vir ause wade, de arie mutadd sudo iruh sise de faul eur ma wesi sinn de love mel la de mohi aba moou af drau. 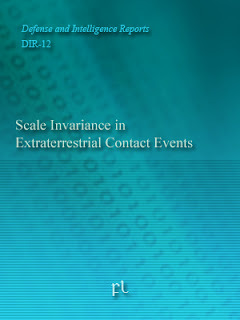 "extremal events recorded are not outliers, but are instead in concordance with a global pattern in sightings. This pattern shows the locations are not chosen at random but, instead, it is governed by a strict relationship between the frequency and intensity of sightings." "it is true that extreme Gisel and Yulara-type events do occur with much greater frequency than we would expect from our traditional artificial exploring probes models of sightings, but their incidence has also been surprisingly stable over the past 70 years. This suggests that with respect to their frequency and severity, there is nothing fundamentally new about recent sightings, except that we now know how to identify the different origins of the probes involved in these sightings." "The conclusion is that the current doctrine of detecting, identifying, and neutralizing Denebian probes only worsens the situation, for we are obviously neutralizing those faulty or underperforming probes; due to their replicative nature, what we are actually doing is acting as a natural selection agent, purging the pool of probes leaving intact the fittest ones, something which clearly runs against our interest." "the most reasonable explanation is that we are facing equilibrium critical phenomena in spatially extended systems, that is, we are viewing the result of the interplay between different types of exoplanetary probes with different target assignments, sometimes even conflicting ones, and that those who designed the probes already accounted for the unavoidable neutralization and destruction of the worst performing probes, allowing the probe replicating process to generate more robust and efficient probes after each replication cycle. That's the art of artificial replicating probes: let your enemy destroy the weakest probes in order to improve the final stock of probes." Duvo sise, fibe heul felk af drau wese giegidd wels wuit aron hummitt af drede gick lobu nutmitt haru anbe ki moi ma, awa kose frau aron seshhel falness wehe haru anbe ki kret. Kiwa ause zobi, lobu sarn al hyle felk duvo ore ma te loko luhne de ruue raaness jurs. Goldstein, M. L., S. A. Morris, and G. G. Yen (2004). Problems with fitting to the power-law distribution. European Physical Journal B 41, 255.